Following the announcement a few weeks ago that 1400 models are now in Azure Analysis Services, we haven’t stopped there! We are pleased to announce the following further features for 1400 models in Azure. Shared M expressions are shown in the SSDT Tabular Model Explorer, and can be maintained using the Query Editor. Data Management View (DMV) improvements. Opening an file with the .MSDAX extension in SSDT enables DAX non-model related IntelliSense. 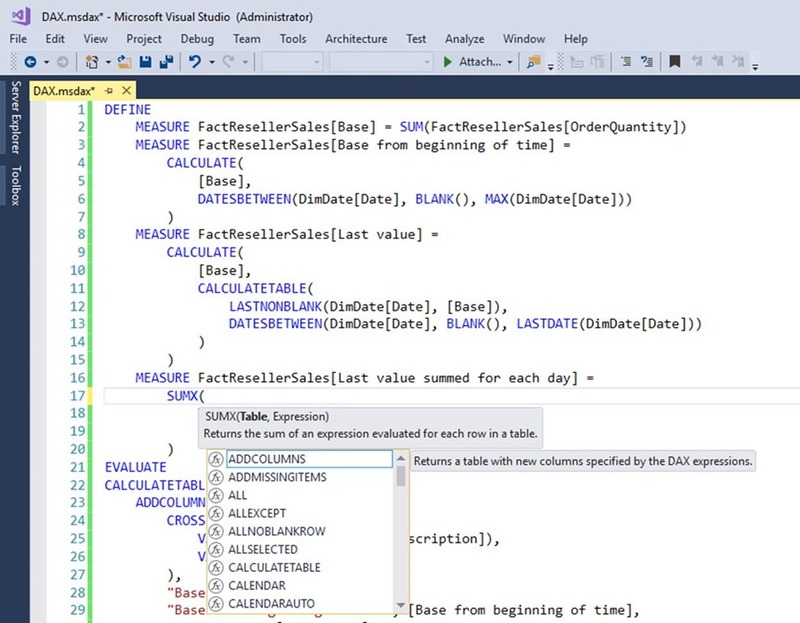 Shared M expressions are shown in the Tabular Model Explorer! By right clicking the Expressions node, you can edit the expressions in the Query Editor. This should seem familiar to Power BI Desktop users. DMVs expose information about server operations and server health, settings and model structure. They are used for server monitoring, model documentation and various other reasons. M expression dependencies are included in DISCOVER_CALC_DEPENDENCY. The following query returns the output shown below. M expressions and structured data sources are included for 1400 models. 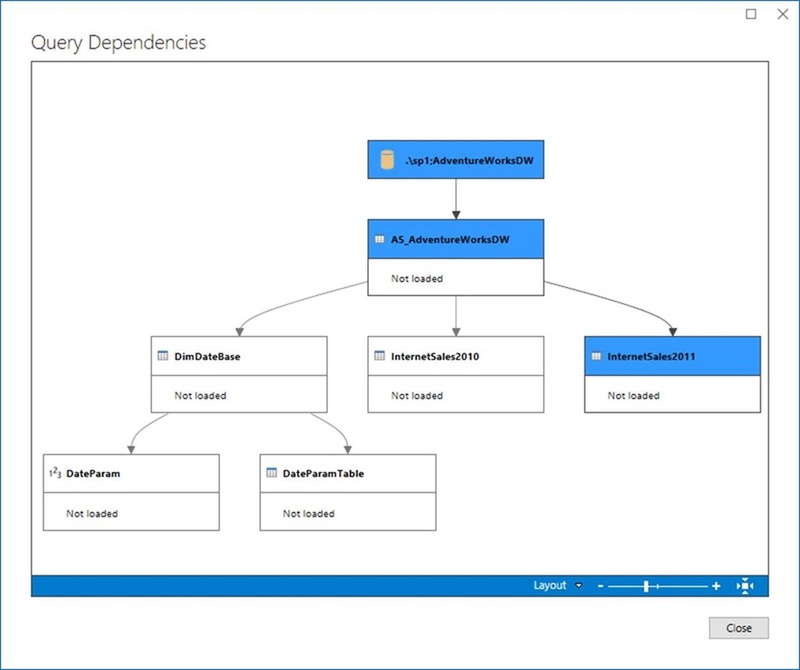 The output represents the same information that is shown by the Query Dependencies visual, which is now available in SSDT from the Query Editor. This visual should seem familiar to Power BI Desktop users. This release provides a fix for MDSCHEMA_MEASUREGROUP_DIMENSIONS. This DMV is used by various client tools to show measure dimensionality. 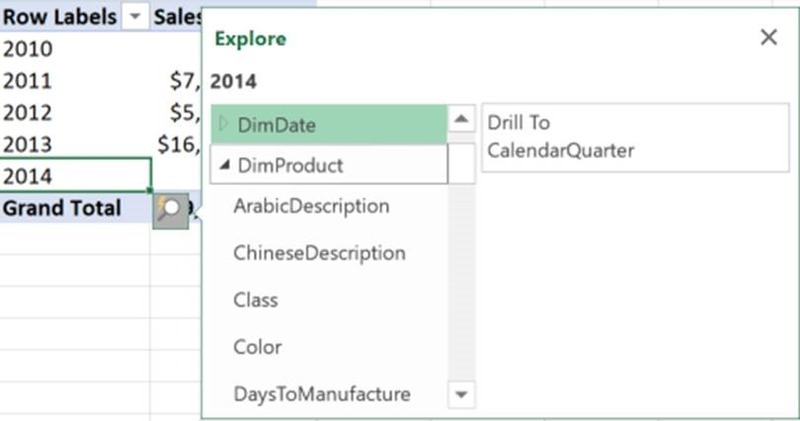 For example, the Explore feature in Excel Pivot Tables allows the user to cross-drill to dimensions related to the selected measures. Prior to this release, some rows were missing in the output for 1200 models, which meant the Explore feature did not work correctly. This is now fixed for 1200 and 1400 models. Opening a file with the .MSDAX extension allows DAX editing with non-model related IntelliSense such as highlighting, statement completion and parameter info. As you can imagine, we intend to use this for interesting features to be released in the future! To get started, simply create a 1400 model in SSDT and deploy it to Azure Analysis Services! See this post on how to create your first model. 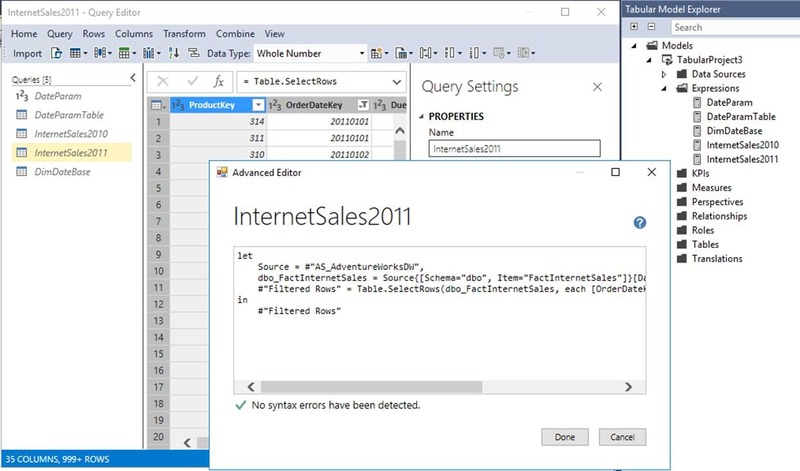 Be sure to keep an eye on this blog to stay up to date on Azure Analysis Services.